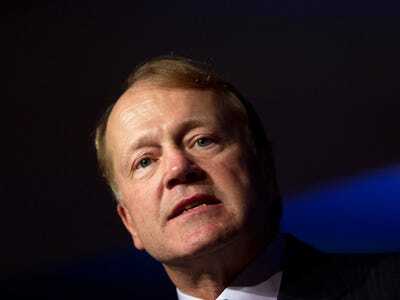 If internet companies can’t make money on high speed internet, they aren’t going to invest billions to build faster networks, Cisco CEO John Chambers warned when talking to Wall Street analysts on Wednesday. He was telling analysts that President Obama’s plan for the internet would be bad news. To recap: Obama wants to categorize the infrastructure that deliver internet services as a “Title II” utility, similar to how telephone utilities operate. This counters a proposal put forth by FCC chairman Tom Wheeler, a former telecom lobbyist, which would allow internet providers to charge big internet companies (Google, Netflix, and so on) to guarantee high-speed service for their content. Opponents of Wheeler’s plan say that this means only the biggest, wealthiest internet companies could afford to have the best internet service, which would hinder innovative startups. Chambers insists that its Obama’s plan that will hurt innovation, because it doesn’t motivate ISPs to invest. Service providers are already “struggling big time in certain geographies on how to make money,” Chambers said. For instance, AT&T said that its going to reduce its capital expenditure budget, meaning it will spend less on equipment. Chambers said he’s talked to AT&T leaders who warned them they will spend even less if Obama’s plan gets approved. AT&T said it very publicly, and obviously, I’m very close to [AT&T CEO] Randall Stephenson and [AT&T CFO] John Stephens and [AT&T Mobile CEO] Ralph [de la Vega]. We know that their capex is going to be down by a fair amount this next year regardless. However, it will be down dramatically more if we don’t get our act together on this Title II issue. There’s a way to accomplish the goals of both sides. I thought Chairman Wheeler’s original approach to this was right on, a right compromise in terms of direction. I think it’s very important we send a message. You are going to see these service providers slow if not pause completely on broadband build out because if they can’t make money on broadband buildout, they aren’t going to build it out. It’s as simple as that. It’s not really that simple. Being a regulated utility doesn’t stop a company for charging enough for its services to be profitable, even if restricts them in some ways. For almost a century, our law has recognised that companies who connect you to the world have special obligations not to exploit the monopoly they enjoy over access in and out of your home or business. Still, Chambers has a reason to be concerned. Cisco makes billions of dollars selling equipment to internet service providers. If they don’t want to upgrade or expand, Cisco loses. Even if they are just postponing or trimming their their plans, Cisco loses. Some of that is already coming into play, Chambers warned. Cisco’s revenues from service providers was down 10% in its last quarter and he blamed, in part, fears over net neutrality.